Topper industrial is proud of their ability to design and build material handling carts for custom applications. See full gallery of CARTS here. Each Topper material handling cart is designed with specific delivery applications and options in mind. Topper will create the best solution for your specific industrial cart needs. 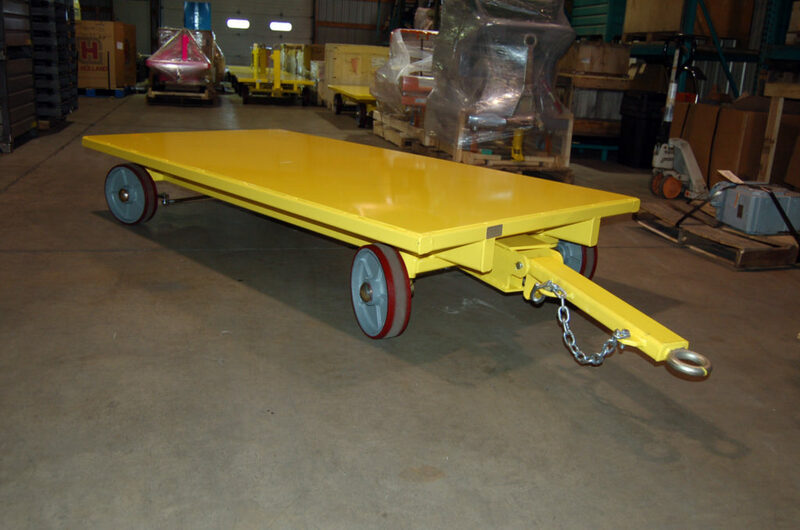 This product highlight is of a quad steer carts.It is designed with a 42″ x 90″ smooth metal deck frame. It utilizes (2) 5/16 Auto-coupling tongue and ball hitch. The hitch height reaches 8″ at the top of ball. This cart is a corner spindle quad steer design. Quad Steer delivery carts track smoothly when being pulled with multiple carts in tow. They are designed to track well and handle tight turn radiuses. This cart is equipped with 12″ X 3″ Polyurethane wheels and tapered roller bearings. It has a 8000# capacity.